I’ve had the privilege to know quite a few nurses in my lifetime. I am lucky to have four great nurses in my life: my father-in-law, my husband’s aunt (who is more like a sister), and two friends that I love dearly (yes you Meggo and Beth). Nursing is not a piece of cake…trust me I know. When I began college I was dead set that I was going to be a nurse. No ands, ifs, or buts about it I was going to be a nurse. I had already been a nurse aid for quite a while and I had made my mind up….until I started taking nursing courses. My mind quickly changed and I realized nursing was NOT for me. I have a huge respect for nurses…it takes a special person to be able to do their job. I don’t watch television…if it’s not on Netflix or Hulu this gal don’t get to see it. So I don’t get to watch daytime television (sometimes I miss getting to watch it…sometimes I don’t). in regards to the nursing field. “There was a girl who wrote her own monologue and I was like ‘Turn the volume up, this is going be amazing, let’s listen.’ She came out in a nurse’s uniform and basically read her emails out loud and, shockingly, did not win. I swear to God it was hilarious,” Michelle Collins, The View co-host. That has to be one of the dumbest things I have ever heard. Has this woman never been to the hospital, doctors office, or any type of healthcare provider?? 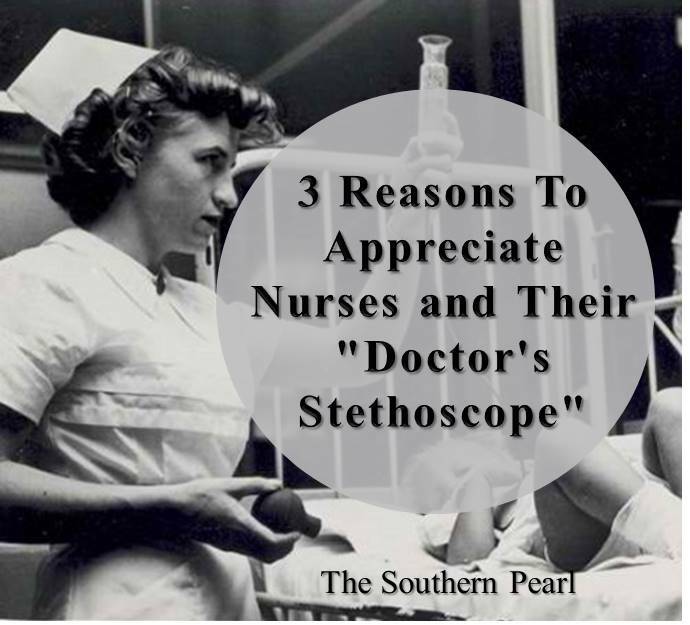 If she has she would know that the nurses use their “doctor’s stethoscope” more than the doctors! Her statement just goes to show her ignorance. I LOVED seeing all of the nurses uniting on social media to take a stand for their professional. What was even more amazing was the fact that doctors took a stand for their nurses. Well “duh” you say….I don’t think people stop to think about it enough. Nursing isn’t just emptying bed pans and giving sponge baths. Most nurses work 12 hour shifts. They are on their feet for 12 hours and constantly on the going to take care of you or your loved ones. They are stressed and overworked. At the end of their long, tiring shift their backs and feet ache. They have to go home and unwind from whatever disaster or mishap that happened that shift. They will lay in bed thinking about what they could have done different or what they forgot to do. Nursing is not only physically draining but mentally as well. They see things that will stay with them forever. You mourn the loss of a family member but nurses mourn the loss of the person they were caring for. I’ve heard losing a patient never gets easier. With all of this being said, nurses don’t have an “off” switch. When they go home, they often take work with them; the aches and pains some physical, some mental. Nurses will miss their children’s basketball games, their families Thanksgiving dinner, and weekends with their spouses so that you or your loved one can receive around the clock care. Have you ever stopped to think about that? They are giving up time with their family to take care of yours. I am by no means downplaying doctors but nurses are the ones on the front line. Think of the nurses as being infantry soldiers and the doctors as being their leader. They are the ones you scream at, the ones you curse, and the ones who advocate the most for your care. The nurses are with you the most, they know you and your situation better than the doctor. They know when something isn’t right and stand up for you when the doctors don’t see it. They sometimes even take a verbal lashing from the doctor because they want what is best for you! There are many, many, many other reasons to appreciate nurses. Why do you appreciate nurses? I’d love to hear yours….comment below. First off, thank you for thinking of me! Since all this with “The View” I have seen all the kind and uplifting comments from other nurses and people who just appreciate nurses speaking up for us and what we do. I have always felt proud to be a nurse but this past week I have felt even prouder. Helping people heal or cope with the cards they are delt is so rewarding in itself, but seeing everyone recognizing how hard nurses truly work and speaking out about it is a wonderful thing. Sometimes it’s easy for people to overlook all the things nurses do for other people. Thank you for dedicating a whole blog post to this. When you tagged me in this I thought it was just an artical you found! Great job! Thank you so much!! Love you! You are very welcome dear! Thank you for doing a job that not just anyone can do! I love you too!